Q: The Mongolian Dada burned the plastic off the bags to stucco. Is that what you advise? A: I have never burned the bags away, especially because I filled my bags with a loose volcanic gravel, so this would not have worked at all. Some people seem to think that removing the poly material makes the plaster stick better. I have found that it sticks pretty well without. I also tied poly twine around the bags to give the plaster something positive to hang onto. Q: You mentioned burning off the bag after assembly. Would there be a need for a wire mesh covering after the burning of bags and before plastering? A: I don't recommend burning away the bags since this is not essential, and only works if the fill material is very solidly consolidated. Wire (or synthetic stucco) mesh will likely make the plaster more durable over time, but is not essential either. Q: Is it ok to use biodegradable earthbags? Most resources I have read say to use polypropylene, or similar. I also read that some people who use heavy clay or adobe-esque material in their earth bags, like to burn off the bags from the side before they apply their plaster. This would imply that a heavy soil would hold its structure even without bags. I am wondering: if I filled the bags with heavy clay-type soil and used barbed-wire and tied on chicken wire, the structure would still hold in a hundred years when the bags have disintegrated. Note that I am only using earthbag for the first 2-3 feet as a foundation and the rest will be straw bale, and this is for a 8'x16' shed. Is this approach advisable? A: The folks at CalEarth have frequently burned off the poly material before plastering, but they typically use cement-stabilized fill. 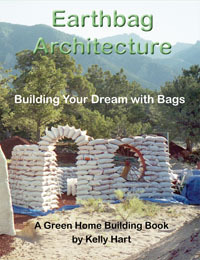 We at www.earthbagbuilding.com don't advise doing this with any kind of fill, as the poly material actually adds strength to the overall structure, and some measure of assurance that the fill remain intact regardless of possible catastrophes. If the polypropylene is kept out of the sun, it will remain strong for a very long time. With foundation bags like what you propose, we also recommend double bagging (one bag inside the other) for even better assurance that the gravel will remain where it belongs.